Epact: Horizontal Dial unsigned, circa 1500 ? 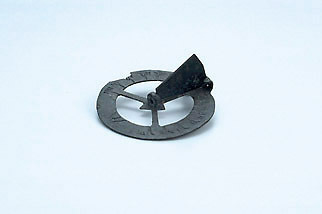 This hour ring and gnomon probably belonged to a horizontal compass dial. The hour ring is marked with common hours, and the folding gnomon is made for a latitude of about 30?. It was found in England and belonged to the Lewis Evans collection in the Museum of History of Science in Oxford.